ROKITT Inc., has developed a number of products in its technology lab since its inception in 2014. After a year of innovating and developing in an incubator environment, ROKITT is announcing the launch of its Data product, ROKITT Astra. 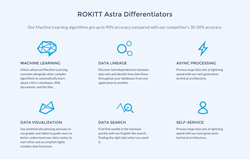 “Through complex algos we developed, ROKITT Astra automatically discovers and self-learns data relationships with up to 90% accuracy,” comments ROKITT’s Cofounder and CEO, Oksana Sokolovsky. “Data holds information that is important to any business. It is trapped in a complex maze of applications and technologies. ROKITT Astra enables companies to better understand their data and leverage uncovered knowledge. ROKITT Astra unlocks the potential and finds the answers your business needs,” Oksana Sokolovsky adds. ROKITT Astra significantly improves data preparation for big data analytics, data governance/compliance, quality assurance/testing, application development and maintenance. ROKITT was founded in August 2014 by Oksana Sokolovsky and Rohit Mahajan, two senior executives with experience running large technology functions in a number of Wall Street’s largest firms. For more information, please visit: http://www.rokittech.com. ROKITT and ROKITT Astra are registered trademarks of ROKITT Inc.
All media inquiries should be directed to Elona Zejnati, Media Relations for ROKITT at 551-225-3816 or elona.zejnati(at)rokittech.com.